Mini pet pigs are great fun, in no time they will become part of the family. Just like children they need love, food, shelter and education. This all requires time and commitment, yet the rewards in the form of joy and entertainment are definitely there. Pigs are smart, social, curious and fun loving. Your pig will bond quickly with you and will start forming habits right away. And you will need a minimum of one acre to keep one. Thus it is best to be prepared for your pig before it arrives. Here are a few suggestions. Pigs need bedding down off damp ground, away from drafts and out of the rain. Some people therefore house them inside, others in a garden shed or a large dog kennel. When pigs first arrive home, especially in winter, I recommend they stay inside at night. Possibly in the laundry with a hot water bottle in a pillow slip for warmth and something to cuddle up to. Sleeping bags make great bedding as the pigs love to burrow into them. Outside, straw is appreciated and you will find your pig totally disappearing underneath it if there is enough. The yard size needs to be at least as big as a tennis court, better still a paddock where the pig can dig to its hearts content. A pig needs secure fencing from ground level to about three feet in height. The easiest way to make a fence pig proof, is to run a hot wire on offsets about one foot of the ground all around it. Shade is essential, especially in summer, as pigs cannot sweat. A shallow container of water large enough to wallow in is highly recommended. Ridged plastic children's wading pools are great and available from toyshops etc. Access to grass and household food scraps (except meat) is enough food for your pig. Over feeding will make your pig over grow in size. Pigs will eat nearly all day if they can. Mini pet pigs are small through both breeding and diet. You are not trying to fatten your pig for market so don't waste your food and money on overfeeding. If you can see their spine and ribs they are too thin, if their cheeks and bottom are flabby then they are being fed too much. If your pig is still not getting enough to eat from your scraps and grass, then you may have to supplement its diet. Veggie scraps from the greengrocer are great, if these are not obtainable, pasture replacement or soaked grain such as barley is available from your local produce store are good. Two cups each day of either of these plus some grass is ample food for a fully-grown miniature pet pig. Don't let your pig eat the dog's or the cat's food as they are higher in protein which promotes growth, not what we are aiming for in mini pet pigs. A maintenance diet high in vitamins and minerals is what we are after. Don't use porcelain or glass dishes for feeding, they will just get broken. Plastic, metal or concrete vessels are the best. Clean water must be provided. Pigs love knocking over water containers, so a very sturdy one is needed. A large concrete bowl works well. Heavy plastic or metal containers fixed to the ground or fence are good. There are also commercial drinkers that let water out on demand when the pig presses on the tap with its mouth; these are available from pig product suppliers. Pigs need a stimulating environment. They are too intelligent to just be locked up all-day and ignored. Plenty of playing and patting in the morning and at night and being taken for walks etc is recommended. Other pets such as dogs as company are great. Toys amuse mini pet pigs as well, old sacks, balls, anything you find they will play with. Freedom to roam and explore will also help occupy them, so the larger and more interesting there yard the better. When confined, pigs will poo mainly in one spot making toilet training and poo collection easy. To toilet train, place newspaper or kitty litter in a low tray, such as a metal baking tray and confine the pig to start within a room such as the laundry. Your piglet will most probably poo in the tray. If not, put the poo in the tray to teach the pig the correct place to poo. Later after the pig has mastered this, take the tray outside. If the pig does a mistake inside, take the mistake outside and show the pig what you have done. It should get the gist of things, but be patient and expect a few mistakes. Mini pet pigs are easily trained to go for walks with a lead and harness. Harnessing should be attempted only after your pig is happy with being touched all over. Allow the pig to run around for a time without holding the lead so as it can get used to it. Make sure the pig can't get the lead caught anywhere as having the lead go tight may scare and stress the pig. When you come to leading, do not pull the pig, but encourage the pig to follow verbally and with treats (but not too many!). If your pig is well cared for with food shelter and love it should be very healthy. We do not immunize our pigs and have not lost any to disease except from pneumonia early on from inadequate shelter during wet cold weather. Pigs do get a form of lice, which is easily treated with a tablespoon of yellow sulfur powder in their feed each day for one week. Don't worry, these lice do not live on humans, pigs are 'allergy free' pets. Your pig may get worms; these are easily killed again with the sulfur treatment. Garlic and other onion family foods also help with internal parasites. Pink pigs can get sunburnt in summer. Shade and suntan cream are the best solutions to for this. We clip the tusks in the pig's mouth before you receive them. Male's tusks will regrow, we don't worry about them, but if they were a problem, get a vet to trim them for you. Keep dangerous chemicals etc away from the pig's reach just as you would for children. Watch out for electrical cords; train them to leave cords alone. All pigs love rooting in the soil. We recommend keeping them in a paddock or at least an area tennis court size so that they can dig all the time. We allow our pigs into the house garden area to be with us and graze. Our pigs will just eat grass for about an hour before they start digging up our lawn. So we then feed them back in their runs. Rings can be put in their nose to stop them digging. I don't like doing this, neither do the pigs. With our pigs doing a great job mowing our lawns in around the house everyday for an hour or so, I only have to mow occasionally, to perfect the job. We have garden beds around our lawns; the pigs are not interested in most of the flowers and shrubs. They can be trouble in freshly turned soil with seedlings. These would need some protection such as chook wire over the area until they are more established. Pigs love veggies, so these would need to be well fenced off. Mini pigs can be very productive. They will remove weeds, rotary hoe and fertilize a garden bed, with joy, vigor and attention to detail. Pig tractor systems can be in portable yards moved over many plots, rotating through fixed gardens or simply leaving them foraging for fallen fruit, grazing and digging under orchards. Their small adult size means the average person can manage a breeding pair. The joy of piglets is immense, the only problem being you may wish to keep them all to add to your collection. Other options are to sell them as pets, send them to market or eat them. 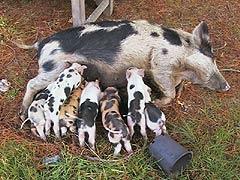 Five to ten piglets are an average litter size and a sow can have two litters per year. If you have any queries we would be delighted to answer them. Happy mini pet pigging.